Samsung's Epic 4G will be launching on Sprint in just a few days (August 31), and rumor has it that Verizon's Fascinate won't be far behind. US Cellular and Cellular South are both slated to get their hands on the Galaxy S as well in the coming months. DALLAS, August 30, 2010 —Samsung Telecommunications America (Samsung Mobile)1, the No. 1 mobile phone provider in the U.S., today announced that it has shipped one million of its Android™ 2.1-powered Galaxy S devices in the U.S. market. 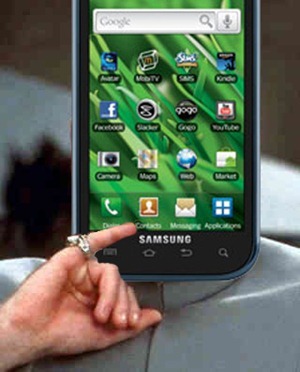 Samsung Mobile began shipping the Galaxy S portfolio2 on July 15, which are currently available with AT&T and T-Mobile. Galaxy S devices will also be available with Sprint on August 31 and will be available with Verizon Wireless, U.S. Cellular and Cellular South this fall. Samsung Mobile has packed cutting-edge technology into its Galaxy S portfolio, including features such as a stunning 4-inch Super AMOLED display screen, 1GHz Hummingbird Application Processor and a multitude of entertainment, messaging and social networking capabilities. In addition, all Samsung Galaxy S devices will be upgradable to Android 2.2 in the future. The roll out of Samsung’s Galaxy S portfolio has been supported by a multi-tiered print, online, cinema and television advertising campaign, including major networks such as ABC, CBS, FOX, NBC, ESPN and MTV and in cinemas such as AMC, Cinemark and Regal. Samsung Galaxy S was also a sponsor of X Games 16, which was held in downtown Los Angeles from July 29 to August 1. From September 30 to October 3, the Samsung Galaxy S lineup will be showcased at the World Cyber Games Grand Final in Los Angeles. In addition, Samsung Mobile has executed a comprehensive Galaxy S social media campaign, which included a Facebook promotion and daily content sharing on Samsung Mobile’s social media channels, which include Facebook, Twitter, YouTube™. As additional Galaxy S devices become available, Samsung Mobile will continue to distribute key digital and video assets to sustain awareness of the Galaxy S.
2 The Samsung Galaxy S portfolio of devices includes the Samsung Captivate™ at AT&T, Samsung Epic 4G™ at Sprint, Samsung Vibrant™ at T-Mobile and Samsung Fascinate™ at Verizon Wireless. Additional Galaxy S devices will be available with U.S. Cellular and Cellular South.